TpT is throwing a Teachers are Heroes sale on Wednesday, February 25! Well guess what? I think SLPs are Heroes!!!! So, I am participating in the sale, but calling mine an SLPs are Heroes sale! You'll be able to receive 28% off of anything in my store when you use the code at checkout. Jenna over at Speech Room News has put together a linky where we can list what we are interested in purchasing, and also list some items we think you might be interested in purchasing during the sale. 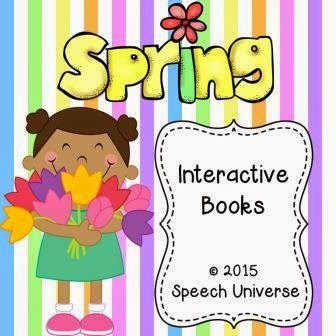 If you have checked out my Winter Interactive Books, I think you will really like my Spring Interactive Books! There are two books included in this packet. Spring Activities has students examine some activities that they can participate in during spring. They will use interactive pieces to complete sentences about activities. What Do You See? will have students explore things that they can see in the spring. There is a repetitive nature to both books, which is great for your younger students. 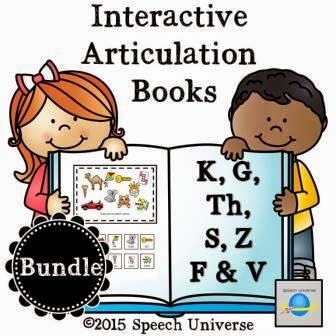 Speaking of Interactive Books, have you checked out my Interactive Articulation Books yet? These have been so fun to use with my students, and there are more to come! This is a progressive bundle, with more sounds in the works, so grab this one at this super low price! It will NEVER be offered this low again! The last of my products that I would like to share is one from last year that got a lot of use in my room. Spring No-Prep Articulation. 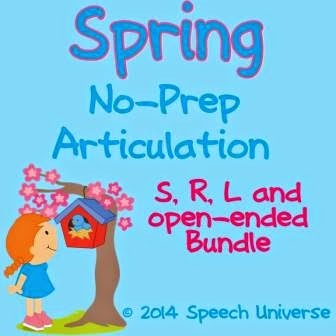 This bundle consists of activities for S, R, and L, plus an open ended packet that you can use with any sound you are working on. Besides the small enormous amount of clipart in my cart right now, I also have a few things that will make my SLP life a lot easier in the next few weeks! I love No Prep activities, and I know I will get a lot of use out of this great Articulation Dot Art set from Mia McDaniel! 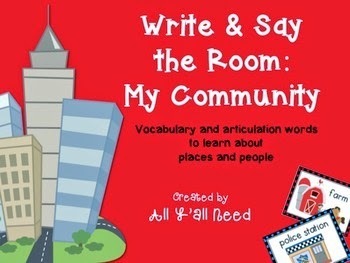 I have also been wanting to try a "write and say the room" activity with my students, and this one that focuses on community vocabulary looks like it will be great. Write & Say the Room: My Community by All Y'All Need looks awesome. I have a lot of students who really need some help with listening skills. 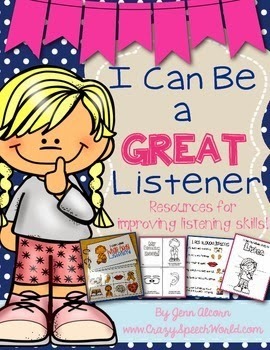 I am looking to purchase Listening Skills Resource Pack for Speech Therapy and Classrooms by Jenn Alcorn looks like something that will also make my life a little easier. 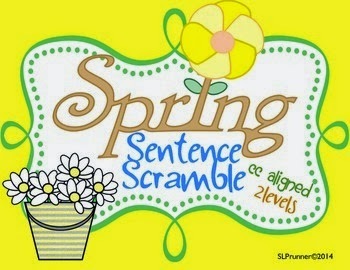 The next pack in my cart is a Spring Sentence Scramble by SLP Runner. With two levels of activities, I am sure to be able to target a variety of students with this packet. The last item in my cart is for a specific student that I have who is working on irregular plurals. 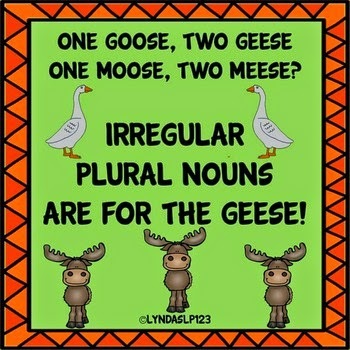 Irregular Plural Nouns are for the Geese by LyndaSLP123 looks like exactly what I need. I hope you have fun picking up a few extra things to get you through spring! Remember to use the code HEROES to get 28% off of everything in my store on February 25th! You can go to Jenna's linky at Speech Room News to discover some more of your favorite SLP bloggers wish lists! I was so excited to see my product on your page! Thanks so much for highlighting Sentence Scramble Jen. Now we just need the spring weather! Happy TpT Sale! I am so ready for spring too! Can't wait to check out your sentence scramble! Thanks for the shout-out! I hope you enjoy My Community!